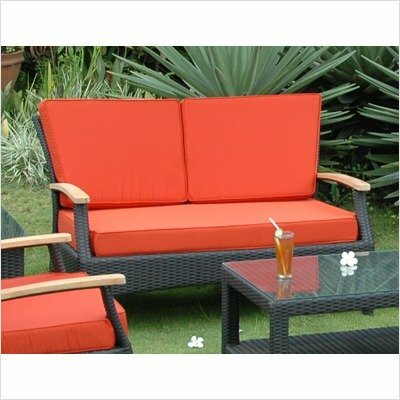 Buy lowest price Anderson Collections Bellagio Deep Seating Loveseat with Teak Wood Arm Fabric: Kamal Chesnut (DS-016LS-30503). This awesome Sofas & Loveseats will suit your rooms. Buy and save your Anderson Collections Bellagio Deep Seating Loveseat with Teak Wood Arm Fabric: Kamal Chesnut (DS-016LS-30503) today. DS-016LS-30503 Fabric: Kamal Chesnut Additional Pieces Sold Separately Features: -Loveseat. -Available in several cushion fabrics. -Cushion color: Dark Green / Terracotta. -Teak wood armrest. -Polyethylene fiber. -All-weather cushions can be upholstered in Sunbrella fabric. -Dimensions: 14” – 33” H x 50” W x 27” – 35” D.